Well, Lydia, you have come to the right place! This is a prolapse (when an organ slips out of place) of the gland of the third eyelid called the nictitans gland. A prolapsed nictitans gland, more commonly known as a “cherry eye” is seen in many breeds, but Cocker Spaniels are the number one breed for having a “cherry eye.” And, I would guess that Gahanna Animal Hospital sees more cockers, and more cherry eyes than any other animal hospital in central Ohio. The excellent rescue, Columbus Cocker Rescue is run by two of our long-term employees, and every cocker they rescue gets seen by the docs at GAH. Thus, we have seen a lot of this condition! Dogs and cats have upper and lower eyelids, as do we humans, but they also have a special third eyelid. This eyelid comes from the inside corner of the eye. It can be pulled up to cover the eye for extra protection. Quite useful when you are running through grass at eye level! The nictitans gland is under this third eyelid. It produces approximately 40% of the tear film that keeps the eye moist and healthy. We don’t know why this happens. There does seem to be certain breeds, such as the cocker that it happens to more than others. 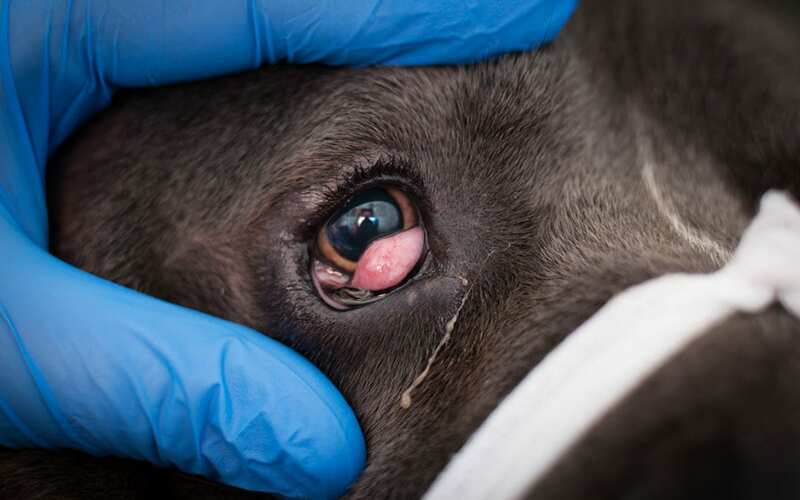 Although it isn’t an emergency, a cherry eye can cause some severe problems for the dog. As with Lydia’s dog, most dogs that get a “cherry eye” are less than two years of age. If it prolapses once, it is likely to happen again. About 40% of dogs that have one third eyelid gland prolapse will have both eyes do so. An untreated “cherry eye” will have decreased tear production and possibly incomplete closure of the eye. This can cause eye infections and dry eye. The dry eye can be severe enough to cause a lot of pain, pigmentation of the eye and blindness. The treatment for a prolapsed nictitans gland is often surgical. The surgeon will replace the gland where it belongs, and sew it in place. After surgery, the dog will likely need to be treated with ointment in the eye for a few weeks and might need to wear an Elizabethan collar (cone). As with any prolapse procedure, there is a risk of re-prolapsing. Because of the loss of tear production, we don’t remove the gland except in cases of severe damage to the gland, or cancer in the gland. If your pet gets that “cherry eye” back, and it won’t reduce and go back to its proper place, certainly, make an appointment to be seen at Gahanna Animal Hospital. The doctor will assess the eye and make recommendations to help your pet have a future of healthful sight! Fortunately, it sounds like your dog is a very good patient if warm compresses are accepted, so treating your dog should work just fine. Thank you Dr. Drost for this informational article. I know this will help ease the mind of a lot of pet owners.